The British sociologist David Lockwood has died at the age 85. David Lockwood's distinction between "social integration" and "system integration" has had a huge impact on Jürgen Habermas's social theory. It was introduced by Lockwood in 1964 in an article in "Explorations in Social Change" (ed. by George K. Zollschan and Walter Hirsch; Routledge). The article is also available in David Lockwood's excellent book "Solidarity and Schism: The Problem of Disorder in Durkheimian and Marxist Sociology" (Clarendon Press, 1992). See the obituary in the Guardian here. One trenchant critique of the Habermasian public sphere conception, voiced particularly strongly by poststructuralist-influenced critics, is that it fails to fully account for exclusion. In this article I examine the strength of this critique. I begin by demonstrating how Habermasians have in many ways already theorized public sphere exclusion. Given this, I ask what is left of the poststructuralist-inspired critique. I argue that what is left is a deep disagreement with Habermasians about the grounding of the public sphere conception. I subsequently ask what difference, and moreover what positive contribution, a poststructuralist (rather than a Habermasian) grounding can make for understanding public sphere exclusion and associated politics. Lincoln Dahlberg is Visiting Fellow at the Center for Critical and Cultural Studies, University of Queensland. He is co-editor (with Sean Phelan) of "Discourse Theory and Critical Media Politics" (Palgrave, 2011). See also Dahlberg's paper "Exclusions of the Public Sphere Conception" (2013). "Upon conceiving constitutionalism on the scale of the nation-state as transparent and unproblematic, one may think global constitutionalism to be a mere utopia. On closer analysis, however, legitimation of nation-state constitutionalism turns out to be much more complex and contested than initially apparent, as becomes evident based on the contrast between liberal and illiberal constitutionalism. Upon the realization that nation-state liberal constitutionalism can only be legitimated counterfactually, the social contract metaphor emerges as a privileged heuristic tool in the quest for a proper balance between identity and difference. Four different theories offer plausible social contract justifications of nation-state liberal constitutionalism: a deontological theory, such as those of Rawls and Habermas, which privileges identity above difference; a critical theory that leads to relativism; a thick national identity based one that makes legitimacy purely contingent; and a dialectical one that portrays the social contract as permanently in the making without any definitive resolution. Endorsing this last theory, I argue that differences between national and transnational constitutionalism are of degree rather than of kind. Accordingly, it may be best to cast certain transnational regimes as constitutional rather than as administrative or international ones." Michel Rosenfeld is Professor of Human Rights at the Benjamin N. Cardozo School of Law, New York. He is the author of ”Law, Justice, Democracy, and the Clash of Cultures” (Cambridge University Press, 2011) and co-editor (with Susanna Mancini) of ”Constitutional Secularism in an Age of Religious Revival” (Oxford University Press, 2014). Gaus on "Public Reason Liberalism"
Gerald Gaus is Professor of Philosophy at the University of Arizona. He is the author of "Contemporary Theories of Liberalism: Public Reason as a Post-Enlightenment Project" (Sage, 2003) and "The Order of Public Reason" (Cambridge University Press, 2011). See my post on the biography here. New Book on "The Global Public Sphere"
Over the last several years, the debate about publics seems to have newly emerged. This debate critically reflects the Habermasian ideal of a (national) public sphere in a transnational context. However, it seems that the issue of a reconstruction of a global public sphere is more complex. 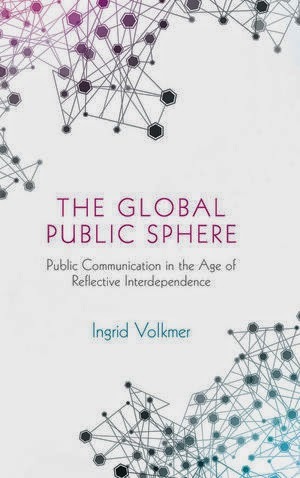 In this brilliant and provocative book, Ingrid Volkmer argues that a reflective approach of globalization is required in order to identify and deconstruct key strata of deliberate public discourse in supra- and subnational societal formations. This construction helps to understand the new processes of legitimacy at the beginning of the 21st century in which the traditional conception of a ‘public’ and its role as a legitimizing force are being challenged and transformed. The book unfolds this key phenomenon of global deliberate interconnectedness as a discursive and negotiated dimension within ‘reflective’ globalization, i.e. continuously constituting, maintaining and refining the ‘life’ of the global public and conceptualizes a global public sphere. Ingrid Volkmer is Associate Professor of Media and Communications at the University of Melbourne. She is the editor of "The Handbook of Global Media Research" (Wiley-Blackwell, 2012). In this video Ingrid Volkmer talks about her work. The broadcast is only available for a restricted period. Lutz Wingert ist Professor of Practical Philosophy at the Swiss Federal Institute of Technology in Zürich. 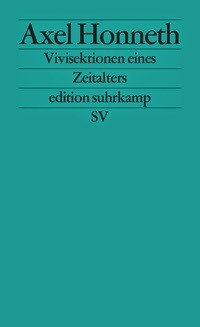 E-book: "Der Aufklärer Jürgen Habermas"
"Der Aufklärer Jürgen Habermas – Zum 85. Geburtstag"
Dass Habermas "ein lebenslustiger und geselliger Mensch" sei, wie es bezeichnenderweise lediglich in einer Fußnote heißt, die einen seiner alte Freund zitiert, will angesichts der langen Erzählung seines Biografen nicht so recht einleuchten. Nach der Lektüre bleibt eher der Eindruck, dass Jürgen Habermas ein ungeheuer arbeitsreiches und diszipliniert geführtes Leben darauf verwandt hat, sehr viel zu lesen und nicht weniger viel zu Papier zu bringen." Discussion: Habermas - Der Kant der Moderne? "Dworkin was nothing if not an inventive and innovative theorist. While like all of us deeply embedded in his time and the ideas of his time, he was carving his views out of his own imaginative resources, to an ever growing degree free from the need to grapple, in his own contributions, with the conventional paradigms set by others, and at the same time, in his critical commentaries on events and ideas, dissecting the presuppositions, ideas and writings and exposing the fallacies of opponents. As is to be excepted, som ideas, or perhaps it is better to call them intellectual tendencies, marked, often dominated, the movement of thought in much of his writings. One dominant trend is the striving towards unity. And Unity is my topic today, or more specifically the unity of value in Dworkin's Justice for Hedgehogs. I will reflect on some of the many things he writes when dealing with that theme. My aim is to clarify his view about the unity of value. In doing that I will meander in different directions, trying out some interpretations before turning to others. In other words, I will try to interpret his views in ways that will turn out not to fit them. In part to show that the interpretations do not fit, and in part to see how closely his views resemble them even so. I hope that by the end of this journey we will better understand his view about the unity of value." See my previous post "Papers on Dworkin's Justice for Hedgehogs". "Habermas, der sein akademisches Projekt mit Weitblick anzulegen weiß, braucht keinen Blindenhund, der ihn durch die «neue Unübersichtlichkeit» der Gegenwart führt. Der Biograf Müller-Doohm folgt daher den Selbstdarstellungen seines Objekts wie ein treuer Anhänger. [.....]." "Das Beste an Müller-Doohms Schrift scheint mir die Erinnerung daran, dass es Jürgen Habermas nicht immer leicht gehabt hat. Ein Schlüssel für seine Fähigkeit, die Öffentlichkeit zu suchen und zu erreichen, liegt in den frühen fünfziger Jahren, als ihm eine akademische Karriere verwehrt schien und er den Lebensunterhalt für sich und seine Familie mit freiem Schreiben verdienen musste. Diese doppelte Existenz als freier Autor und akademischer Wissenschaftler hat Habermas zu seiner Lebensform gemacht. Sie ermöglichte es ihm, zum Max Weber der Bundesrepublik zu werden – unbestechlich in seinem politischen Urteil, den Widerspruch herausfordernd, akademisch, aber strategisch denkend und planend, um seinen Typ von Wissenschaft zum führenden zu machen. Habermas ist es gelungen, Formulierungen für seine Theorie zu finden - «herrschaftsfreie Kommunikation» oder «den zwanglosen Zwang des besseren Arguments» - die sich nicht mehr vergessen lassen." Another version of Detlev Claussen's review has been published in the Swiss newspaper "Tages-Anzeiger": "Seine Bücher eroberten die Welt". See my post on a review of the biography in "Die Zeit". Interview with Habermas in "Kölner Stadt-Anzeiger"
"In einer kulturell und weltanschaulich pluralistischen Gesellschaft ist das demokratische Verfahren die einzige Quelle für Entscheidungen, die als legitim anerkannt werden. Dieses Verfahren gewährleistet grundsätzlich zwei Dinge: einerseits Inklusion, also die Einbeziehung aller Bürger, andererseits Deliberation, z.B. Wahlkämpfe und Parlamentsdebatten, die den politischen Entscheidungen von Wählern oder Gesetzgebern vorausgehen müssen. Das Ergebnis von politischen Wahlen, die über die Machtverteilung zwischen konkurrierenden Parteien entscheiden, unterscheidet sich von demoskopischen Umfrageergebnissen vor allem durch dieses Element vorangehender öffentlicher Debatten. Das hat nichts mit wissenschaftlicher Erkenntnis, aber viel mit der Erwartung zu tun, dass politische Probleme auf eine möglichst rationale Weise gelöst werden. Diese Rationalitätserwartung verlangt nämlich, dass zuverlässige Informationen und gute Gründe für relevante Vorschläge öffentlich auf den Tisch kommen. Dabei spielen normative Gründe oft eine viel wichtigere Rolle als empirische Feststellungen und wissenschaftliche Expertisen – aber es sind in jedem Fall Gründe, die zählen sollen. Diese kognitive Dimension der Willensbildung von Bürgern und Politikern ist umso wichtiger, je größer die Unsicherheit ist, unter der politische Entscheidungen gefällt werden müssen." The interview has also been published in "Frankfurter Rundschau" (June 14, 2014) and in "Berliner Zeitung" (June 16, 2014), entitled "Die Lesarten von Demokratie". Review of Habermas Biography in "Die Zeit"
” Habermas, der am kommenden Mittwoch 85 wird, bekommt nun pünktlich zum Geburtstag seine erste große Biografie […….]. Geschrieben hat sie Stefan Müller-Doohm, emertierter Soziologieprofessor in Oldenburg, der 2003 eine voluminöse Biografie Theodor W. Adorno vorgelegt hat. Auf 750 Seiten schildert er nun Leben und Werk des ”berühmtesten lebenden Philosophen der Welt”, wie ihm der Rechtstheoretiker Ronald Dworkin einmal genannt hat. Habermas selbst war zunächst skeptisch bei dem Gedanken, dass ein Biograf in seinen ”Gedärmen wühlen” würde. Jedoch stand er dann für Gespräche zur Verfügung und gewährte Einsicht in seine Korrespondenzen. Einen wohlwollenderen Biografen allerdings hätte er sich auch kaum wünschen können: Geheimnisse werden nicht ausgeplaudert. Müller-Doohm folgt in der allermeisten Wertungen seinem biografischen Subjekt. Somit bekommt diese detaillierte Biografie einen brav-offiziösen Touch, was die faszinierende Figur von Habermas nicht verdient hat." "Die schönste Anekdote dieser Biografie gilt Peter Handke: Bei einem Autorentreffen habe dieser Habermas gefragt, was er von den Beatles halte - auf die Antwort des Philosophen, er würde die Beatles nicht kennen, reagierte der Dichter mit Schlägen. Adorno hingegen hätte die Antwort beglückt. Dabei ist Habermas währlich kein Stubengelehrter, sondern ein bestens vernetzter homme de lettres, mit einer Sammlung moderner Kunst und engen Schriftstellerfreunden wie Max Frisch und Martin Walser, im Falle Walsers allerdings in allmählicher Entfremdung. Einen "Mann voller Spannungen" nannte ihn der Litteraturwissenschaftler Karlheinz Bohrer, der ihm in freund-schaftlicher Gegnerschaft seit Jahrzehnten verbunden ist." See the press release from the University of Oldenburg here. See my previous post on the biography here. A number of European intellectuals - among them Jürgen Habermas, Anthony Giddens and Ulrich Beck - have published a joint appeal to the European Council to "take into account the elections to the European Parliament" and that the Commission President shall be elected by the European Parliament. See the appeal "Europe's Democratic Moment". 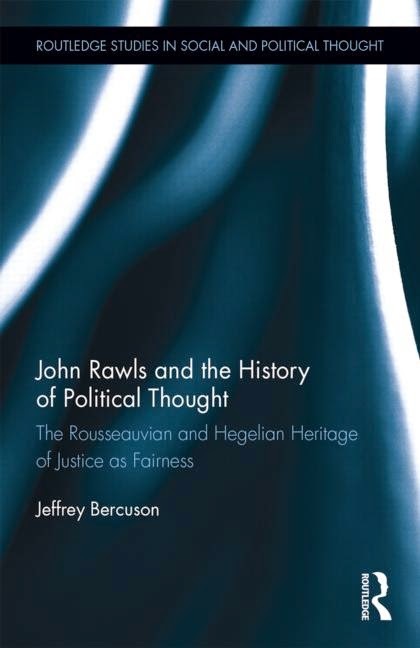 In this book, Jeffrey Bercuson presents the immense, and yet for the most part unrecognized, influences of Jean-Jacques Rousseau and Georg Wilhelm Friedrich Hegel on John Rawls, the most important political philosopher of the 20th century. While the well-documented influence of Immanuel Kant on Rawls is deep and profound, Kantian features and interpretation of justice as fairness do not tell the whole story about that doctrine. Drawing on Rawls’s Lectures on the History of Moral Philosophy and his Lectures on the History of Political Philosophy, Bercuson presents the reader with a more nuanced, accurate account of the moral and political philosophy of Rawls in light of these under-appreciated influences. This new, richer image of Rawls’s political philosophy shows that Rawls’s notion of reasonableness – his notion of the kind and extent of our obligations to those fellows with whom we are engaged in social cooperation – is conspicuously more demanding, and therefore more attractive, than most interpreters and critics assume. Rawls turns to Rousseau and to Hegel, both of whom provide attractive images of engaged citizenship worthy of emulation. Jeffrey Bercuson is an Instructor of Political Science at the University of Toronto, Mississauga. The book is based on his PhD thesis: "Reconsidering Rawls: The Rousseauvian and Hegelian Heritage of Justice as Fairness" [pdf]. See also Bercuson's paper "An Ethical Community? Kant and Hegel on Cultural and National Particularity". His master's thesis on "Patriotism, Self-respect and the Limits of Cosmopolitanism" (2007) is available here. An abstract here. The term vivisection refers to an operation carried out on a living organism in order to understand its inner workings. In a sense, this is also a fitting description for the operations carried out by the theorists whom Axel Honneth portrays in this study: they dissect the flow of events in order to gain insights that can in turn be made productive for their theories. Be it Franz Rosenzweig at the beginning of the 20th century, Siegfried Kracauer during the Weimar Republic, or Judith Shklar in the shadow of the Holocaust, they all vivisected their present moment in order to formulate an adequate concept of history, of society, and of politics.